Galway-based Starcave Studios have released a new tech demo video (101mb) of their game Terra: Formations, expected on the PC, Xbox 360, and PS3. The developer says the game will be a triple-A title, containing FPS, RTS, and RPG elements, mixed in what Starcave call a massively multiplayer online adventure. The new video shows a marked improvement in graphics since the last video released in March. Set in the year 2157 the with earth plundered of all resources humans explore a Jupiter moon named Europa, with melting ice they find an enemy in waiting. Still in development, Terra: Formations is due sometime in 2007. StarCave Studios have released an adventure tour game, 'Camelot Galway - City of the Tribes'. Is mainly aimed at the education and tourist markets, it allows players to explore a colourful and upbeat recreation of medieval Galway. Unlike what reports late last year on RTE Online, Aertel, and a number of sites, the game was only released in the past few days, according to the developer this was due to a “last minute decision” by the publisher. Priced at $19.95 USD (about 16.50 euro), Camelot Galway is now available to try or buy at garagegames.com; there are also plans to sell it at retail in Galway, mainly at tourism-based locations. The game, which was made using a Galway street map dating to 1651 AD, includes eight historical stories split between 55 pages that can be collected around the city, a number of mini-games (archery etc), object information featuring their English and Irish names, and advertisements for current day shops. At industry show E3 last May, StarCave boss Keith Killilea told Games Toaster that “A year ago StarCave Studios was only a dream”, ambitiously adding that "We're going to be no. 1". The PC and console developer is based in Galway, Irish owned, privately funded, and owns three indie studios - Staridia in Brazil, Cellien in the US, and Single Cell in Australia. Last August, the company ran their publicity launch and first birthday party at the Eye Cinema in Galway (pictured, right). Besides Camelot Galway, they screed footage of their upcoming budget-priced first person shooter games Illumina and Terra Formations, as well as a 3D character-build from what may be their flagship title, ‘the 14 Tribes’. 14 Tribes is an action-adventure set in the Ireland of the folklore character Cuchulainn, it is in development using the Reality Engine and is planned as a PC and Xbox release. 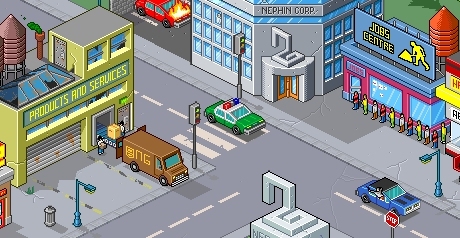 Two Galway-based games companies have recently launched new websites, PC and console developer StarCave - starcave.com, and mobile games developer Nephin - nephingames.com (pictured above).